Welcome to the getting to know your thyroid series. Over the coming weeks, we will get to know your thyroid gland, how it works and gain an understanding of what you can do to help manage thyroid function more effectively. Over the past year I have seen more patients presenting with a range of thyroid symptoms that are being missed by standard testing. As you will see many of these symptoms can occur as part of multiple health conditions such as depression, anxiety and menopause. Let’s start by getting to know your thyroid gland and understand how it functions. Thyroid Gland – What is it? The butterfly shaped thyroid gland is located just below the voice box (larynx). The gland itself weights about 30gms and has a rich blood supply, receiving 80-120 ml of blood per minute. Thyroid follicles comprise most of the thyroid gland and under the influence of Thyroid Stimulating Hormone (TSH), they actively secrete thyroxine. The follicular cells produce thyroxine which is also called tetraidothyronine or T4 because it contains four atoms of iodine, and triiodothyronine or T3 which contains three atoms of iodine. Together these hormones are referred to as thyroid hormones. These follicles also contain parafollicular cells, or C cell, they product the hormone calcitonin, which helps regular calcium homeostasis. The thyroid gland is the only endocrine gland that stores its secretory product in large quantity, normally about a 100 day supply. T3 & T4 are synthesized by attaching iodine atoms to the amino acid tyrosine, stores for some period of time, and then secreted into the blood. Thyroid hormones increases basal metabolic rate (BMR) by stimulating cellular oxygen use to product ATP (energy). A major effect of the thyroid hormones is to stimulate synthesis of the enzyme that runs the pump, Sodium Potassium ATPase. As cells use more oxygen to produce energy, more heat is given off, and body temperature rises. This is called the calorigenic effect of the thyroid hormones. In this way, they play an important role in the maintenance of normal body temperature. In the regulation of metabolism, the thyroid hormone stimulates protein synthesis and increase the use of glucose for energy production. They also increase lipolysis (fat breakdown) and enhance cholesterol excretion in bile (made in the liver to aid fat digestion), thereby reducing blood cholesterol levels. Together with hGH (human growth hormone) and insulin, thyroid hormones accelerate body growth, especially growth of the nervous tissue. During the early years of life, low thyroid hormones results in small stature and poor development of certain organs such as the brain and reproductive organs. The thyroid hormones enhance some actions on the stress hormmones; catecholamines (adrenalin & noradrenalin). For this reason, symptoms of hyperthyroidism include increased heart rate and more forceful heartbeats, increase blood pressure and increased nervousness. 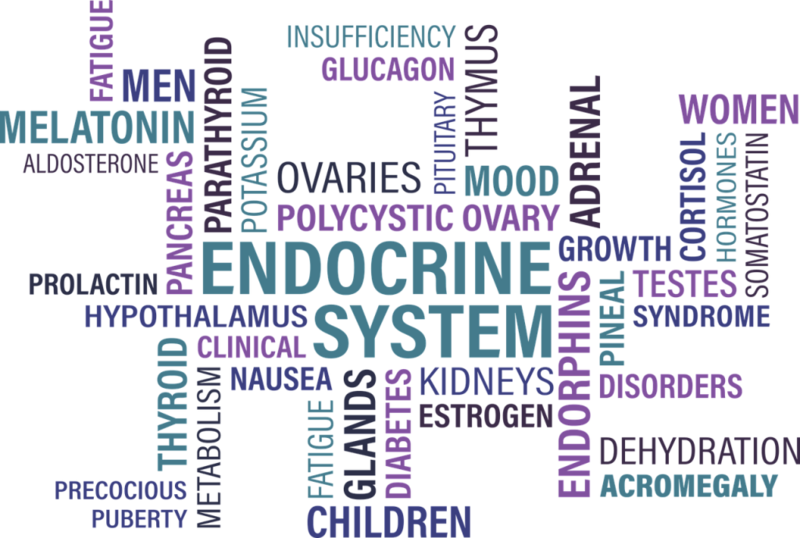 What controls Thyroid Hormone Secretion? By negative feedback systems involving both the hypothalamus and the anterior pituitary gland. Although iodine is needed for synthesis of thyroid hormones, an abnormally high concentration of thyroid iodine suppresses release of thyroid hormones. How does negative feedback works to regulate thyroid hormone secretion? Then, TSH stimulates almost all aspects of thyroid cell activity. Blood levels of T3 & T4 increase until the metabolic rate returns to normal. An elevated level of T3 & T4 inhibits release of TRH and TSH. Conditions that increase ATP demand – a cold environment, low blood sugar, high altitude and pregnancy also trigger the negative feedback system and increase the secretion of the thyroid hormones. The parathyroid gland attaches to the outside lobe of the thyroid gland. Parathyroid hormone (PTH) increases the number and activity of osteoclasts (bone destroying cells). This results in bone resorption which release calcium and phosphates into the blood. It inhibits the reabsorption of phosphates filtered by the kidneys so that more of it is excreted in urine. PTH decreases blood levels of phosphates and increases blood calcium and magnesium levels. The third effect of PTH on the kidneys is to promotor formation of a hormone called calcitriol, synthesized from Vitamin D. It increases the rate of Calcium, Phosphate and magnesium absorption from the GIT into the blood. Just by understanding more about the function of your thyroid gland you can start to see the various effects it can have on your health ranging from energy levels, digestive function, nutrient absorption, temperature regulation, mood balance and particularly weight management. Is a poor function thyroid gland part of why you can’t lose weight? In the next part of the thyroid series we will explore thyroid nutrition requirements, conditions of thyroid dysfunction starting with Hypothyroidism & Hashimotos Thyroiditis. We will introduce Naturopathic health management options; nutritional and lifestyle interventions to help manage thyroid conditions. Optimal thyroid function is important in every stage of your life. Remember to subscribe to our regular updates in the link below. Share with a friend today.